Dodgers manager Dave Roberts received word of an unexpected critic following his team's loss to the Red Sox in Game 4 of the World Series: the president of the United States. The Dodgers lost the crucial game, 9-6, and fell behind 3-1 in the series. Los Angeles blew a 4-0 lead in the game -- a point not lost on the leader of the free world. 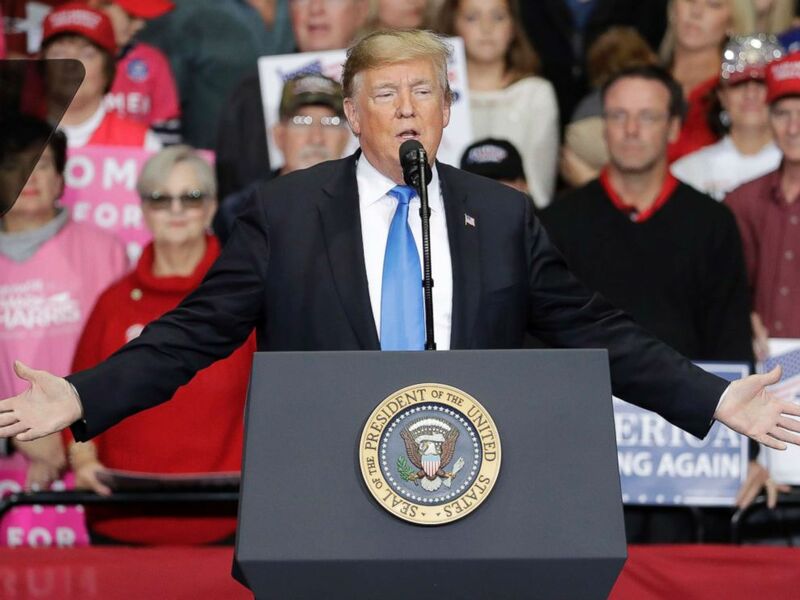 "It is amazing how a manager takes out a pitcher who is loose & dominating through almost 7 innings, Rich Hill of Dodgers, and brings in nervous reliever(s) who get shellacked," Trump tweeted to his 55.4 million followers. "4 run lead gone. Managers do it all the time, big mistake!" The manager-in-chief's words of wisdom were received with skepticism from Roberts. "The president said that?" Roberts asked reporters when told of the tweet in his postgame press conference. "I'm happy he was tuning in and watching the game. I don't know how many Dodgers games he's watched. I don't think he was privy to the conversation. That's one man's opinion." Hill had thrown 91 pitches and 6 1/3 innings of shutout ball when Roberts removed him from the game. The L.A. bullpen proceeded to surrender nine runs, including one credited to Hill. Roberts has been manager of the Dodgers since 2016. He holds a record of 287-200 in the regular season and 23-18 in the postseason. He had taken the Dodgers to back-to-back World Series for the first time since 1977-78. 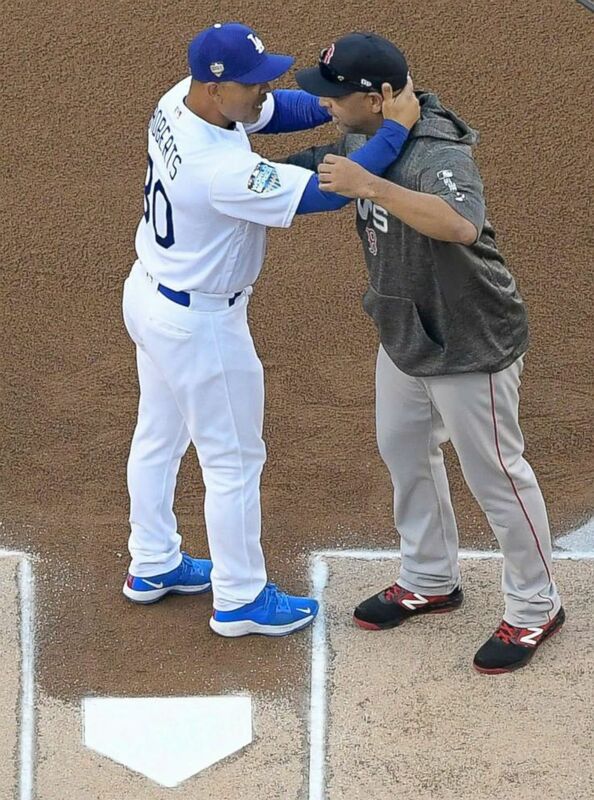 Los Angeles Dodgers manager Dave Roberts and Boston Red Sox manager Alex Cora hug before Game 3 of the World Series baseball game on Friday, Oct. 26, 2018, in Los Angeles. Boston manager Alex Cora dismissed Trump's criticism as well. "Dave Roberts is a good manager," Cora responded before leaving the podium. Cora is a native of Caguas, Puerto Rico, and was critical of the president's response to Hurricane Maria, which devastated the island in 2017. "To be tweeting about 3,000 people [dying] and being efficient, it's actually disrespectful for my country," Cora told Mass Live in September after Trump questioned the hurricane's death toll. "We see it that way. I know he probably doesn't feel that way." Cora was wearing a T-shirt that read "Proud for Puerto Rico" during the press conference on Saturday. As a Yankees fan, Trump was likely rooting against the Red Sox, as well. He was close friends with late Yankees owner George Steinbrenner and may also have some lingering resentment for Roberts, whose stolen base against New York in Game 4 of the 2004 American League Championship Series set up a historic Red Sox comeback and the team's first title in 86 years. Trump doesn't tweet about baseball much -- Saturday's tweet was sandwiched between praise for conservative commentator Dinesh D'Souza and condemnation of the shooting at a synagogue in Pittsburgh -- but of course he's made attacking the NFL a hallmark.